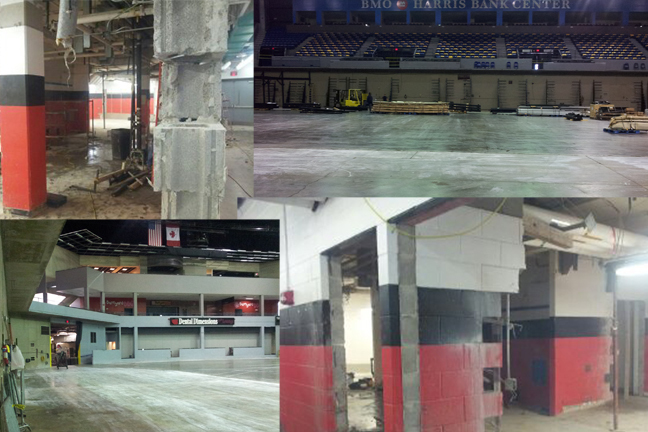 Renovations continue at the BMO Harris Center where BMO Harris Bank Center and local construction crew members are in the stages of replacing the seating structure in the building’s lower level, making way for a new, updated seating system. New seats will be added and the new seating capacity inside the BMO for hockey will be 5,895 up from 5,767. Along with new seats, the BMO Harris Bank Center is also in the process of expanding the visitors’ locker room. Both projects will be ready for the IceHogs Saturday, Oct. 19 Home Opener against the Grand Rapids Griffins. Click this link to see photos of all the renovations. Season Tickets On Sale: Take advantage of all the great benefits that go along with IceHogs season tickets including same great seat for every game, never a wasted ticket policy, up to 30% savings off the price of tickets and more! Call (815)-847-6399 to reserve your seats or for more information.